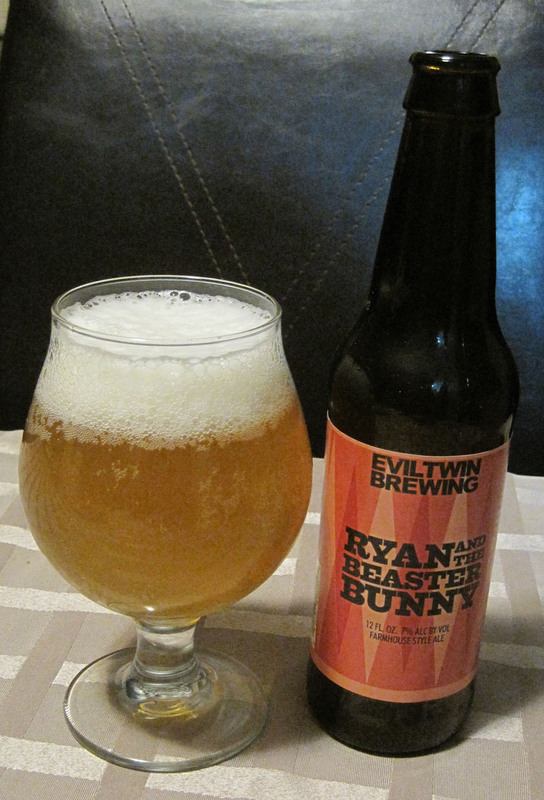 Evil Twin – Ryan and the Beaster Bunny: Brewed in Connecticut by Two Roads ala Evil Twin Brewing, this Easter farmhouse ale measures up at 7.0% alcohol and was poured from a 12 oz bottle at home to help celebrate Easter. I love a good theme, so it was great to find a fitting beer, even if it is just clever marketing. Aroma and Appearance: Pours a hazy blonde with two fingers of foam with loads of tiny bubbles rising from the bottom of the glass. Aroma consists of corriander and peppery spice. Flavour: Like most farmhouse ales, this one has a bit of funky sour flair to it with a light body and a nice dry peppery finish. Actually a Saison, It goes down easy, has the right amount of bittering hops and the perfect mouthfeel for the style. Overall Impression: this has everything going for it, a nice clove aroma, a good peppery finish, an awesome name and bottle and is a well executed example of the style. Rating: I give it a 9/10, it’s awesome as the balance of flavours come together perfectly and offers everything I expect from a Saison and more. Food Pairing: Easter dinner, what else? Was this beer explosive for you? I had a bomber and it took forever to pour. It was very good though. No, in the smaller bottle they seemed to tone down the carbonation a bit, probably so it didn’t explode the bottle itself. Good foam, but not too much. Personally I thought the bombers were way over carbonated. Glad to hear they have toned it down.